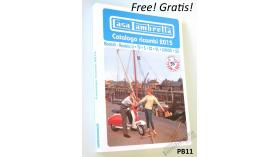 21/11/2017 Free Casa Lambretta catalogue! FREE upon request with your order! These were previously Euro 10 to the public but Vittorio has now decided that these are FREE! As it's a heavy bit of kit (a catalogue weighs just over 1kg), postage costs will apply - although for most European destinations, for orders up to 30kg in weight, there is no variation in your shipping costs! We will shortly be adding a box to 'click' on during the Checkout process, where you can add a FREE catalogue to your order*! 20/10/2016 FREE RLC T shirt offer! FREE RLC ‘T’ SHIRT OFFER! Since last April we’ve been supplying a RLC FREE ‘T’ SHIRT for ALL orders placed on-line for goods over Euro 130.00 (not inclusive of postage costs) . Our RLC ‘T’ shirts have always been a top selling line and remember, all are screen printed on high quality cotton shirts. We have also recently upgraded to heavy duty 200g shirts as well! We’ve now added a section on the final part of on-line orders where customers are obliged to indicate their ‘T’ shirt size. 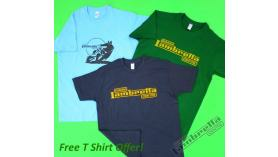 ALL orders for goods over Euro 130.00 that are completed on-line will automatically include the FREE ‘T’!